MOUNT CARMEL CHAPTER DAR, NOVEMBER 14, 2017, MEETING. Covered by three Program presenters. fitness standard. Males must be between 5’10” inches and 6’4” and Females between 5’8” and 6’2” . The members of the Honor Guard have weight regulation and must score at least 230 out of 300 on Army Physical Fitness and have free range of motion. Education basic educational requirements high school diploma or equivalent. And score 31 on Armed Services Vocational Aptitude Battery’s Armed Forces Qualification Test arithmetic reasoning, math knowledge and verbal composite score and 110 on general technical . the 3rd Infantry Regiment has critical security task of escorting the president of the United states. All that join the Army Honor Guard must have clean criminal record no civil convictions no convictions under the Uniform Military Code of Justice and free of any drug or alcohol-related incidents. The amount of information give in Tom’s presentation covered Historical, Patriotic and was Educational to all attending. Repenting Patriotic. Marilou beautiful Quilts were also a work of Art one was a beautiful nine block. 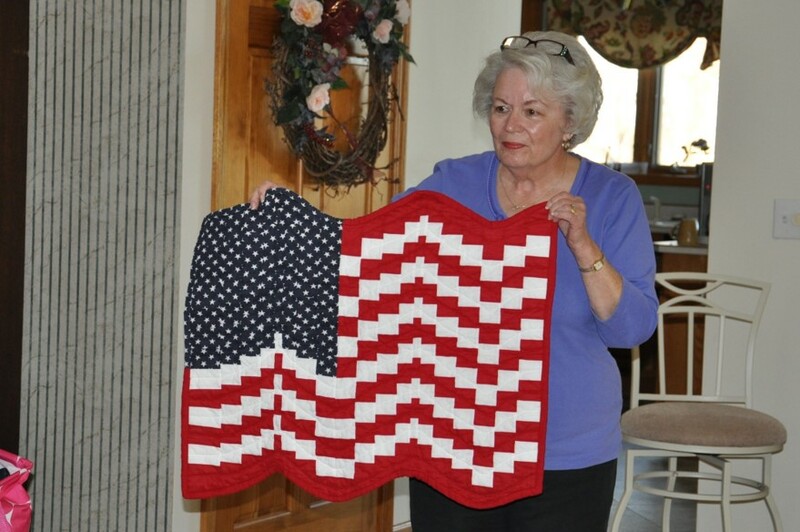 Thanks to Ann and Marilou for the Historical and Patriotic Quilts they are works of Art that they shared with member Of Mount Carmel Chapter DAR.